If we can all agree on one thing, it’s that we love good food. In fact, we love it so much that sometimes we spend time reading about it online instead of eating it. That’s why learning how to start a food blog is such a great idea. If you’re a foodie, then you probably have a lot to talk about. Choose a delicious name for your blog. Sign up for a web hosting plan. Chart out a plan for your blog’s growth. Choose a platform for your food blog. Add the final touches and publish your first recipe. We have a lot of ground to cover and a lot of good food to try out, so we’ll get right to it. Let’s learn how to start a food blog! Before we talk about how to start a blog, we need to discuss something that’s pertinent when creating any type of site: what you’re going to call it. In most cases, people stick with the same name for their blog all throughout its lifetime. Some websites try rebranding, but the process can be somewhat convoluted, so it’s often best to find a good name from the beginning and stick with it. Try to keep it short. The shorter your blog’s name is, the easier it’ll be to remember. Naturally, this rule isn’t set in stone, but if you’re struggling to choose a name the simplest alternatives are often the best. Look for names with available .com domains. When it comes to top-level domains, .com is the most well-known and widely used, so it can be a smart move to pick a name with a matching available .com domain. You have hundreds other choices, but sticking with a tried and tested option can’t hurt. The name should explain what your blog is about. For example, you wouldn’t call your food blog ‘John’s Diary’ or ‘My Personal Blog’. In either case, people would have no idea what they’re in for when you’re promoting it. As far as culinary blogs go, you might want to consider names that reference food and the kind of recipes you plan on sharing. For example, some good real-world examples include How to Cake It and Love & Lemons. If you do a quick online search for food blogs, you’ll notice a lot of shorter, catchier names are already taken, such as “Plated“, “Pinch of Yum“, and “Pick Up the Fork“. Try to find something that is equally memorable, which also has an immediate association with food and cooking. Once you find a domain that you’re both happy with and that’s available, all you have to do is register it. To register a domain, you’ll need to pay for at least a year of ownership upfront and provide some personal details. Once that time is up, you’ll have the option to renew it, but you don’t need to worry about that just yet! By now, you’ll have both a name and a domain for your food blog. Your next step is going to be signing up for a hosting plan, which means paying for server space where your website and all its content will be hosted. If you’re unfamiliar with the concept of web hosting, it can seem a little overwhelming. But in reality, it is not as difficult as you might imagine. Shared hosting. With this type of plan, you share a server with other people. This is almost always the cheapest option, but it is a reliable platform for any food blog that is just starting out. Business hosting. This is the sports car of the hosting world. You get dedicated resources and the power of cloud computing. Business hosting provides the best possible performance and customizability, but it’s by far the most expensive option. Virtual Private Server (VPS). With a VPS you get a virtual computer all to yourself, although it’s still located on the same physical server other customers use. The difference is that you get root access and dedicated resources. But managing it requires technical expertise. With Hostinger, you get access to great shared hosting plans, which are more than enough to handle a growing blog until you start getting thousands of visits per month. Plus, you also get around-the-clock support and a one-click installer for your blogging platform of choice at no extra cost. You can always upgrade seamlessly to a plan that offers better performance, so you’ll save money in the long run. So far, we’ve been working on your blog’s foundation. Now, we’re going to talk more specifically about how to start a food blog. What type of content do you want to publish? Will you be doing all the work yourself or outsourcing some of it, and if so, what’s your budget? Do you want to monetize your food blog, and if so, how should you do it? Let’s start with the first question. For example, maybe you want to review restaurants, or maybe you have a knack for coming up with new recipes, taking fantastic photographs of each step, and breaking it all down for other people. You might also want to focus on testing and reviewing new culinary products. Whatever angle you choose, you need to be sure that it’s something you enjoy doing. Otherwise, you might find yourself burning out quickly, and have trouble motivating yourself to continue. Once you have an idea in place, you need to chart out a schedule you can follow at least during your first months. In most cases, we recommend committing to one or two blog posts per week, to begin with. A lot of people try to write dozens of posts when they start out. If you can do that, then all the more power to you. However, it’s important to understand that it takes time for new blogs to gain traction. Your goal is to make it through those first several months with your enthusiasm intact. That way, when real traffic starts coming your way, you’ll be able to scale your food blog further to meet the demand. To do this, you might want to outsource some of the work to other people. For example, you can hire freelancers to write the occasional post for your blog. However, food blogging is quite a demanding niche, since it often requires first-hand experience. As such, finding freelancers who can do the subject justice can be difficult, although not impossible. Finally, you need a plan for monetizing your blog from the get-go if you want to earn money from it. As a food blogger, you have several options. For example, you could include affiliate links to kitchen products in order to earn a small commission when somebody uses those links to buy the products. You could also run ads for local restaurants, or even set up online courses for cooking lessons, which you can charge for. Those are all viable plans, so we recommend you read up on how each of them works and consider which option would work best for you. Perhaps one of the most important steps of learning how to start a food blog is figuring out how you’re going to build the website itself. There are several approaches you can take for this step. For example, you could hire somebody to do it for you, if you have the budget. However, you may also want to do it yourself, especially if you have some web development experience. Even if you don’t, you can still create a site by using a Content Management System (CMS), which simplifies the whole process. CMSs are platforms that enable you to publish and manage different types of content, as the name implies. When it comes to blogging CMSs, they usually include functionality to organize your posts, set up individual pages, manage users, and more. While there are plenty of CMS options you can choose from, let’s quickly take a look at the three best alternatives. First off, we’ve got WordPress. 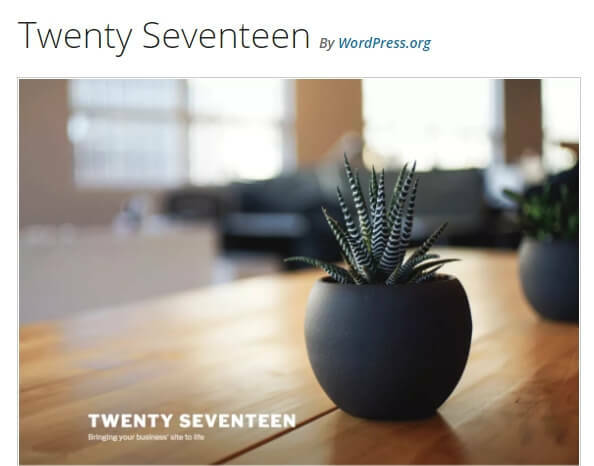 This CMS is by far the most popular blogging platform on the web. It’s easy to use if you’re a beginner, but it’s also flexible enough for complex websites. There’s a vibrant community built around the CMS, and you can customize your sites using themes and plugins (of which there are thousands). Next up, we’ve got Joomla!, which is not quite as beginner-friendly as WordPress but is still relatively simple to pick up. Joomla! is excellent when it comes to managing multiple types of content, which means it’s a good option if you don’t just want to blog. The platform is also highly customizable, albeit not quite to the same degree as WordPress. Finally, we’ve got Drupal. Among CMSs, Drupal has a reputation for being especially difficult to pick up, as it’s one of the more advanced solutions. However, the effort can pay off due to how scalable and flexible the platform is. It can be overkill for a small food blog, but if your website gets massive you might still want to consider Drupal (as it’s also one of the most secure CMSs). For most bloggers, we recommend that you stick with WordPress. 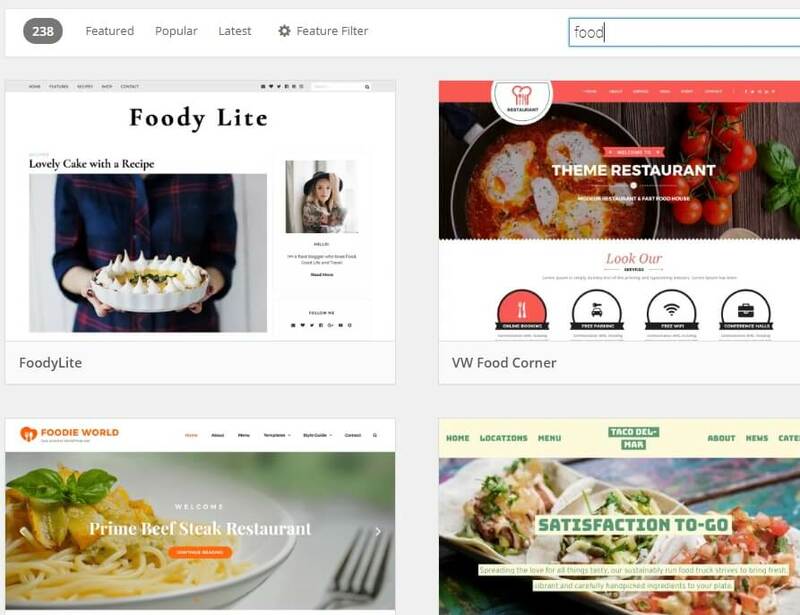 This platform strikes a perfect balance between user-friendliness and wealth of features, which makes it ideal for a food blog. As such, go ahead and install WordPress on your web host. When you’re ready, let’s move on to the final step of your journey on how to start a food blog. We’re near the finish line of learning how to start a food blog. At this stage, you should already have a fully working website with its own domain, and a plan in place for where you want to take it in the future. Just remember to check the user reviews for any theme before you install it on your site. As a good benchmark, you should try to use themes with a user rating of 4 stars or higher. Also be sure to check out if the theme has received any recent updates since you don’t want to use one that’s abandoned. This plugin enables you to add links to Amazon products you want to promote on your blog. If people end up using one of these links to buy a product, you get a cut of the profits, provided that you’re an Amazon affiliate. In any case, you should take some time to look around and see what other interesting food-related plugins there are out there. Just remember to follow the same advice as with themes – look for high ratings and recent updates, to make sure you only add high-quality plugins to your site. Once you’re done polishing up your blog, remember to get working on your first recipe or review. That’s it; you just learned how to start a food blog! Learning how to start a food blog is more straightforward than you might imagine. Once you have a domain and hosting, it’s all a matter of choosing a blogging platform and getting to work. We’re big fans of WordPress, since it’s versatile enough for most types of sites, and it’s a particularly good match for food blogs. Plus, you get access to a lot of plugins and themes to help you create recipes and publish reviews. Do you have any questions about how to start a food blog? Let’s talk about them in the comments section below!